Sixteen players from across the land assembled under grey Southport skies for this annual tournament. The recent rain was a gift from above for the parched lawns after the recent hot spell, which had now regained their green colour. 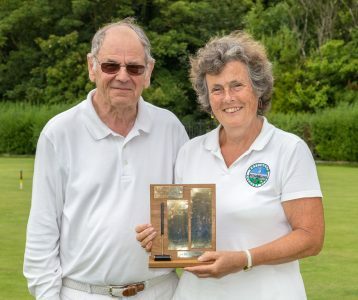 The Super B was won by Beatrice McGlen from Nottingham with the Runner Up being Clive Goode also from Nottingham. Beatrice also had a handicap reduction to -0.5. 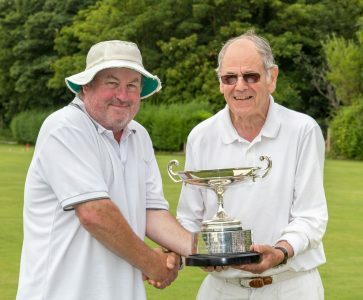 The B Level winner was Graham Good from Bowdon who also had a handicap reduction to six. Beatrice in a closing speech thanked the Southport club for an excellent tournament. Contestants gathered from all over the country to play in this prestigious tournament. Players came from Surbiton, Bowden, York, Westmorland, Crake Valley and a huge contingent from Nottingham. The great surprise they all had when walking through the surrounding hedges was the site of lush verdant green lawns. These may have been slow in places but they held their own wibbly wobbly challenges. They proved to be a real challenge to those from the east who have become used to playing on brown frazzled glass like surfaces. There were sixteen entries with handicaps ranging from 0 to 9. They were split into two blocks of 8, the Super B from 0 to 2.5 and the B level from 3 to 9. The Super B was won by Beatrice McGlen and the runner up was Clive Goode both from Nottingham. In doing so Beatrice received a handicap cut to -0.5 for the first time in her career. The B Level was won by Graham Good from Bowdon and the runner up was Jim Allcock from Crake Valley. Graham Good had his handicap cut from 7 to 6 after winning all his matches. The prizes were presented by Southport president Prof Alan Pidcock. John Haslam managed the event in his inimitable fashion with no crises or at least he never saw them. The food was absolutely fantastic. The ladies of Southport surpassed themselves with salmon and asparagus on puff pastry with a cream sauce, new potatoes and mange tout peas. Followed by homemade chocolate cheesecake and creme fraiche. The manager even contrived to control the weather, Saturday overcast but warm with the occasional cooling drizzle. Sunday overcast but with the occasional searing burst of sunshine. A glorious weekend of croquet was had by all.